The story of the great Raghuvamśa rāja Dilīpa is well known. As other Raghuvamśa kings, Dilīpa was a firm follower of Dharma, a Satya vādi, a mitabhāṣhi, a Vidvān and ruled his praja, loving them as their own father. However, he had only one cinta. He and his wife Sudakṣhiṇā did not have santānam. Once he, along with Sudakṣhiṇā devi, went to the āśramam of their kulaguru Vasiṣhṭha mahaṛṣhi. He did yathāvidhi namaskārās to his Guru and told him about his cinta. Vasiṣhṭha mahaṛṣhi with his divya dṛṣhṭi saw the reason for Dilīpa not having santānam. He told Dilīpa "Once you went to Devalokam. While returning from there, knowing the Dharmaśāstra that a bharta needs to be in the company of his patni who is ṛtusnāta, you were in a hurry to come to Ayodhya to follow that Dharma. And in that hurry you did not notice the presence of the great Kāmadhenu, who was sitting under the shade of the Kalpavṛkṣham. The uttamās, especially the Gomāta, are always pūjanīyam. Pūjya pūjāvyatikramam was done by you. Shreya will stop if such a mistake is committed. Hence, Kāmadhenu told you that you will get santānam only after you do yathāvidhi pūja to Her or Her santānam. However, you did not hear Her words because of the noise from the running of aśvas and ratham". Dilīpa asked his Guru to bless him with a chance to do Goseva to Kāmadhenu and thus do prayascittam for his mistake. Vasiṣhṭha mahaṛṣhi then told Dilīpa "Do not worry. At present Kāmadhenu went to pātālalokam to help the ṛṣhis in their yajñam. Till She returns do seva to her daughter Nandini. Kāmadhenu will then surely save you from the doṣham and bless you with the great Raghu mahārāja, who will equal you in his good character." "O Dilīpa! You cannot stop me; I am a Śiva kinkara. I am living here with Śivājña. I am Kumbhodara, the friend of Nikumbha. Everyday Lord Śiva uses me as a pādapīṭham while mounting Nandīśvara. Do you see this Devadāru vṛkṣham — it is like a son, equal to Subrahmaṇya, for Pārvatī mātā. Once an elephant rubbed against it and a piece of its bark fell and caused pain to it. Seeing this Pārvatī devī asked Parameśvara to give her a means of always protecting it. Paramaśiva ordered me to protect it and gave the adhikār to eat any creature that enters and spoils the sanctity of this forest". Dilīpa was worried why all his valour, dhanurvidya did not help him protect the dhenu and got pacified once he came to know that the lion was Lord Śiva's kinkara. Because he knows before Bhagavat-śakti his śakti is ati-alpam. He said "O great Kumbhodara! Lord Śiva's ājña must be followed by me too. But Nandini is my Guru's property. I must return Her to Him safely. Please understand and I will suggest one thing which is ubhayaśreyodāyakam. Please kill me and lower your hunger and leave Nandini." Kumbhodara laughed and said "O mūḍha. You are the eka chatrādhipati of this chatussamudravelāvalayita medinīchakram. You resemble Manmatha in beauty and you are very young. Why are you paying adhikamūlyam for such an alpa-prayojanam? You are offering your life for one cow. If you loose it, you can give crores of cows to Vasiṣhṭha mahaṛṣhi. If you really have bhūtadaya, what about the crores of people who live happily under your rule? Will you make them anāthas? Leave this idea. I will make sure u will not get apakīrti and Guru droham." Dilīpa answered "One who gives rakṣha from kṣhatam is a kṣhatriya. A kṣhatriya who cannot be an āpadāt- praharta, how can he be a king? Before my eyes this Nandini dhenu is getting an āpada. How can I stand seeing it? Then what will be the use of such nindā-mālinya jīvanam? O great Kumbhodara I cannot fight a Śiva kinkara please help me." Finally Kumbhodara accepted and Dilīpa was able to move. He happily bent down and waited for being eaten by him. To his surprise puṣhpa-varṣham started and Nandini took Her divyākṛti. She told Dilīpa "O great Dilīpa! Not only this lion, nothing can harm me because of the tapobalam of Vasiṣhṭha mahaṛṣhi. I just wanted to test your character. I am impressed with you. Please take my divya kṣhīram. Eat it with your wife and you will get sat-santānam". Dilīpa, who was a vidvān in all Dharmaśātras replied like this "O Gomātā! I am dhanya to have your anugraham. I will take your kṣhīram, once your hungry calf and the ṛṣhis, who need it for their pūjas and yajñas take it. After they take I will take a share of 1/6 of your kṣhīram" (Since a king can take at the maximum 1/6 of the property of his people as tax!). Cow is the most sacred animal for Bhārateeyas. Devatas, Trimūrtis, many punya tīrthas reside in different parts of Gomāta. The importance of a Guru is shown well in the story. It is a Guru who guides what to do and not. Without Vasiṣhṭha mahaṛṣhi's help Dilīpa would not even know the reason for not having santānam. Though Dilīpa was a great śūra, he had no ahankār. He thought before Bhagavat-śakti his śakti is ati-alpam. When he offered his life to save Nandini, Dilīpa showed his Guru-bhakti and respect on Gomāta. The knowledge of Śātras helped Dilīpa decide what to do and what not, when advised by Kumbhodara. The mahonnata vyaktitvam of Dilīpa is shown when he said he will take kṣhīram after the calf and the ṛṣhis take. The Rājaneeti of Dilīpa is displayed when he said he will take 1/6 of kṣhīram. The story of Yayaati, the son of the great Nahusha and Priyamvada, is well known. He after ruling his kingdom for many years, without deviating from the path of Dharma, made Puuru the chakravarti. Then he took Vaanaprasthaashramam and went to tapoovanaas. There he did many ghora tapaas, yagnyaa, yaagaadi kratus. He satisfied the agnideva with Havis and his Pitrudevataas with his punya karmaas. He did great tapas for a thousand years. He did tapas remaining as niraahaara for around 30 yrs. Then he did tapas for 1 year being in between Panchaagnis having Vaayubhakshana. For 1 year he did tapas staying under water, standing on 1 leg. After many such years of tapas, he went to deva looka in a divya vimaana. He took the poojaas of many great devarshis there. After a long stay there, he went to Brahmalookam and took the poojas of brahmarshis. Then finally he reached Indra loka. Indra, who is well-known for his divya vaibhavam, Himself recieved Yayaati and gave arghya paadyaas. Indra after doing athaavidhi atithi satkaaram to Yayaati, told him “O great punyaatma! What immense tapas did you do to have recieved poojaas by Brahmarshis and Devarshis! Your punyaas are immense and it is not possible for me sing all your great deeds”. Listening to this Yayaati got little Ahankaar. He said “O Indra deva! True. Sura, Daitya, Yaksha, Raakshasa, Nara, Khechera, Sidda, Munis tapas are not equal to mine.” Indra got unimpressed by the vaakyaas of Yayaati. He said “In your tapoobhimaanam, you insulted the tapas of the great maharshis. You are not fit to be here. Go back to Bhulokam and remove your darpam and come back”. Yayaati immediately realized his mistake and pleaded Indra “O great Indra! The very moment I insulted great rishis, all by tapas-shakti was lost. In addition to this, please do not make me got to Bhulokam again. Please grant me permission to stay in the sassaangatyam of good people in Sat-Bhuvanam”. Indra seeing the pashchaattapam of Yayaati sent him to Sat-Bhuvanam. Yayaati, repenting for his mistake, stayed in Sat-Bhuvanam and slowly regained his tapas-shakti. Once the dauhitraas of Yayaati — Ashtaka, Pratardana, Vasumanta, Ausinara and Shibi, in course of time, reached Sat-Bhuvanam. They saw a man with divya tejas and was brightly glowing with tapas-shakti (they saw Yayaati). They approached him and asked his details. Yayaati told his entire story. He told them about Indra’s shaapam and continued “One must never speak low of an uttama. Dambham, darpam, abhimaanam, krodham and paarushyam, in what ever small quantities, are more dangerous than ghora Vishaagni. It destroys hard-earned punyaas due to many years of tapas”. Realizing that the person was their grandfather, the five dauhitraas did namaskaars to Yayaati. Yayaati then taught them Dharmopadeshaas — about Paralokam, sarva gnyaana sampatti, sakala raaja dharmaas, satgati-durgati swaroopas, varnaashrama dharmaas and jeeva garbhoptatti. Even a small sentence or act done due to ahankaar is enough to destroy huge punya raashis. Even for a person as great as Yayaati, one small paarushya vaakyam melted his punya raashis. The importance and power of tapas is well portrayed in the story. One must be very very careful while talking about great people. Indra was angry on Yayaati since he spoke low about rishis. A sajjana never does a mistake. Even if he does, he immediately repents and never repeats it. He does not feel shy to openly tell others his mistake and help them not repeat it. This sat-guna is clearly showed by Yayaati. Sat-saangatyam is the first step to reach God. Hence Yayaati asked Indra to grant him that. Gauramukha maharshi is one of the great well-known maharshis. He was the obedient shishya of Semeeka maharshi (see Parikshit mahaaraja's story). After his education in Semeeka maharshi's ashram, he built up his own ashram to share the gnyaanam he got. The ashram was calm and peaceful. If Gauramukha maharshi's shishyas came to the forest to get some samidhas for yagnyam, then the trees used to bend and willingly, without experiencing pain, used to offer them their branches. If the shishyas while doing veda paarayana and by mistake pronounce some swara wrong, then the birds used to rectify them by saying it aloud with their sweet voices. The flowers there used to open only to be offered to God, just before the puja. All these were possible only because of the prashantata, the alhaada vaataavarnam and the tapas-shakti of the maharshi. One day the king, Durjaya, came with his army to the forest. Gauramukha maharshi seeing the king gave aatithyam and requested the king to rest in his ashram for that night. Lord Raama and Lakshmana, during their visits to muni ashrams, used to always leave their weapons outside and enter the ashrams with the permission of the respective munis. 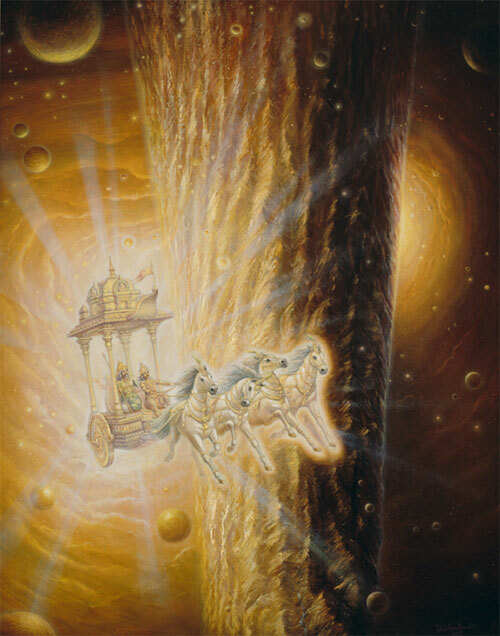 However, Durjaya entered the calm and quiet ashram with his entire army. Gauramukha, who already conquered anger, was happy to welcome them. Since he had no apparent way of cooking food and showing a place to rest for such huge number of people, he went to the bank of the river, took a dip in it, became purified and prayed to Lord Vishnu. Due to his enormous concentration, Vishnu immediately appeared before him and gave him a Mani. With the help of the Mani, Gauramukha maharshi built a huge town for the army to rest and also provided good food for them. The next day as the king and army were leaving the place, the creation of the Mani vanished. Durjaya was amazed by the power of the mani and after reaching his kingdom sent his messengers to get the mani of Gauramukha maharshi for himself. Gauramukha maharshi sent the messengers back saying that the mani was not meant to be used for selfish reasons and must only be used for the good of the society. The king became angry knowing that his order was not carried out and sent his army to maharshi's ashram to get the mani by force. Gauramukha maharshi prayed to the mani and a huge army came from the mani and destroyed the army. The unbeatable Vishnu chakram came from the mani and killed the king Durjaya. The whole army and Durjaya were killed in a nimisham! Thus the forest in which Gauramukha maharshi lived was henceforth known as 'Naimisaaranyam'. Naimisaaranyam, is a very pious place for the Indians. It is the abode of many Gods, rishis, munis and was the place where the great Suuta maharshi told Srimad Bhaagavatam to saunakaadi mahaamunis.